For most adults, it’s hard to imagine spending time without a cell phone. In fact, current statistics suggest that the average American over the age of 14 engages with screens upwards of 10 hours a day, despite that research shows the damaging effects of being so dependent on digital devices. Biola Rosemead School of Psychology alumna Doreen Dodgen-Magee (Psy.D. ’92) is a technology and psychological health expert and recently published a new book outlining how to combat the current imbalance most of society faces when it comes to technology. 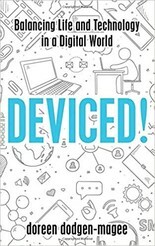 Her book, “Deviced! : Balancing Life and Technology in a Digital World,” releases Nov. 8, 2018. Dodgen-Magee’s book explores the alterations technology makes in a person’s life including changes to the brain, relationships and personal life. She offers a realistic look at how we can better use technology and break away from bad habits, as well. The book is laid out in a way for the research to be accessible so anyone can see how technology may be impacting them or the culture around them. Dodgen-Magee believes that people need to stop shaming those whose technology use differs from others, and, instead, start listening to each other about how and why people engage technology. Here, she shares her passion for healthy tech use and some tips to break bad technology habits. Doreen, you are a technology and psychological health expert. What does that mean? My training at Rosemead provided me with everything I needed to be a psychological health expert, including the awareness that I would need to be a lifelong learner in order to stay current and effective as a psychologist. Tuned in to what I believed (and research demonstrated) would facilitate healthy development across the lifespan, as technology became an ever present part of our days I began to wonder how this might impact our developmental trajectory. In order to understand the intersection of technology and psychological health, I began to seek out high quality research regarding both. Over the last 15 years I have been committed to this work. It pains me when a therapist, physician, or parent says “I hate technology” or “I don’t believe in texting/gaming/whatever thing they are uncomfortable with.” If we are not staying aware and informed regarding the cultural realities our clients (patients/children) are living in, we are at risk of operating out of our own bias. This can cause harm. Since not everyone can stay current on every shift in life and culture we must all follow our calls and then share what we learn with others. My call is to the work of how technology is shaping us and how we might all respond with greater intention. How did you become interested in researching the effect of technology on people’s psychological health? I couldn’t find answers to any of these curiosities in the research so I began doing my own anecdotal surveys, asking everyone who would answer. At the same time I devoted increasing amounts of time to combing scholarly research and pop culture findings in order to educate myself as much as possible. After offering talks at a few local schools and parents groups I began being invited to offer continuing education to therapists, physicians, and educators. Quickly, I found myself traveling all over the world to speak. When I did so, I would seek out any experts in the area of technology and the digital domain in order to learn as much as they would share. Can you give us a sneak peak into some of the alterations technology makes in our lives that you mention in the book? Technology is changing our brains and bodies, our interpersonal relationships, as well as the way in which we develop and maintain a sense of self. At the same time it is also allowing us to live further outside of ourselves than we’ve ever been able. Our attention spans are shorter, our willingness to be uncomfortable and/or inconvenienced is diminished, and our face to face communication skills go unpracticed. We lack boredom tolerance which leads us to seek stimulation. The vicious cycle goes like this: our device use leaves us ill equipped for our embodied lives which, in turn, leads us to engage our devices to escape the unknown, quiet, or out of our control embodied environment. Many of us have bought the lie that stimulation is really soothing. We play video games, or watch endless hours of Netflix, surf Pinterest for longer than we want to admit, or listen to podcasts every waking minute and think we are calming ourselves. In reality, most forms of technology engagement actually activate us neurologically and physiologically. Without intentionality, moderation, and deliberate practice we will become people who can only live comfortably in overly activated and stimulated states. There are psychological and practical costs to this kind of living. What are a few of the solutions you propose, either personal or corporate change that you see as needed or possible for people to make? I propose that each of us get very honest with ourselves about how we engage technology and why. Are we using it to avoid embodied encounters or experiences? Are we turning away from embodied living in order to spend increasing amounts of time in digital spaces? Are we keeping our in person and face to face communication skills in check? Are we operating from a deep and grounded sense of self and personal agency or are “follows" and “likes" buttressing our sense of self? Once we have asked, and answered, these difficult questions (which are laid out in the form of assessments in the book) we can begin to moderate our use in intentional ways. Suggestions regarding how to engage the best of technology well and reduce the most potentially harmful forms are rampant through the book. The goal isn’t abstinence or avoidance. The goal is, instead, moderation with a strong commitment to living the kind of wild, beautiful, stretching, complex, and interesting life that motivates us to put our phones down regularly and engage our embodied spaces. Research tells us that even 10 minutes a day of quiet in the form of mindfulness meditation (which can look very much like contemplative prayer) can rebuild the parts of the brain impacted by technology use. The issue is that, even that short amount of time is currently difficult for most of us to achieve. My work is focused on trying to change this. Do you hope your book and information like this will change society’s relationship with technology? I am deeply grateful for the privilege I have been given to speak with over 30,000 individuals in our country and overseas in the past several years. This has also made me aware, however, of how massive the cumulative impact of technology is. Every time I sit at a table with a group of gamers, in a lecture hall with university students, at grand rounds with physicians, or any other sacred space, I am blown away by the stories I hear of personal tragedy and triumph related to occurrences in digital spaces. Many times I walk away from a speaking engagement or research circle thinking, “The problems are too big to address and the benefits are so glorious that there’s no way we’ll be able to tackle this reality effectively. We can’t have the great things that technology brings while, at the same time, trying to keep our use from hurting us.” Then, I’ll get very quiet and remember how profoundly my own life has been changed by moderating my engagement with technology. I’ll remember the Biola student who, a year after I spoke in chapel, found me at a soccer game and told me that he’d been practicing doing 10 minutes of mindfulness meditation the first time he picked up his game controller every day and how much it had changed his ability to be calm. I remember the doctors who share their frustration with needing a computer between themselves and their patients and how much they benefit from the data that reminds them that eye contact and basic verbal communication are, in themselves, healing. I consider the bullied student who thanked me, after the assembly, for making her understand why the trolls had impacted her so much and what she could do to turn her pain around. I remember the hundreds of stories like this and feel confident that simply helping people consider their use in non shaming ways can help them become more embodied, content, authentic people who are open to meaningful relationships with themselves, each other, and God. I remember that these small shifts, when made repeatedly and shared with others, could eventually work together to make a major shift. This makes me very deeply glad. How did Rosemead impact your career and how you view technology and psychological health? I will forever believe that Rosemead provided me with the most incredible foundation available to a psychologist. The emphasis on rigorously executed research, the push for deep critical analysis, and the focus on didactic learning offered solid ground from which to launch. Faculty who was committed to helping me become an excellent clinician and, more basically, communicator offered training even after my time at Rosemead ended. Rosemead encouraged in me a deep curiosity about things and then provided me with the tools to go out into the world and accumulate data with excellence and humility in mind. For more information about Rosemead’s programs and application process visit their website. Written by Jenna Loumagne, manager of media relations. For more information, contact Jenna at (562) 777-4061 or jenna.loumagne@biola.edu.